Poverty profoundly affects education. Poverty's grip on education manifests on the first day of school. Children from poor families are less prepared in kindergarten. 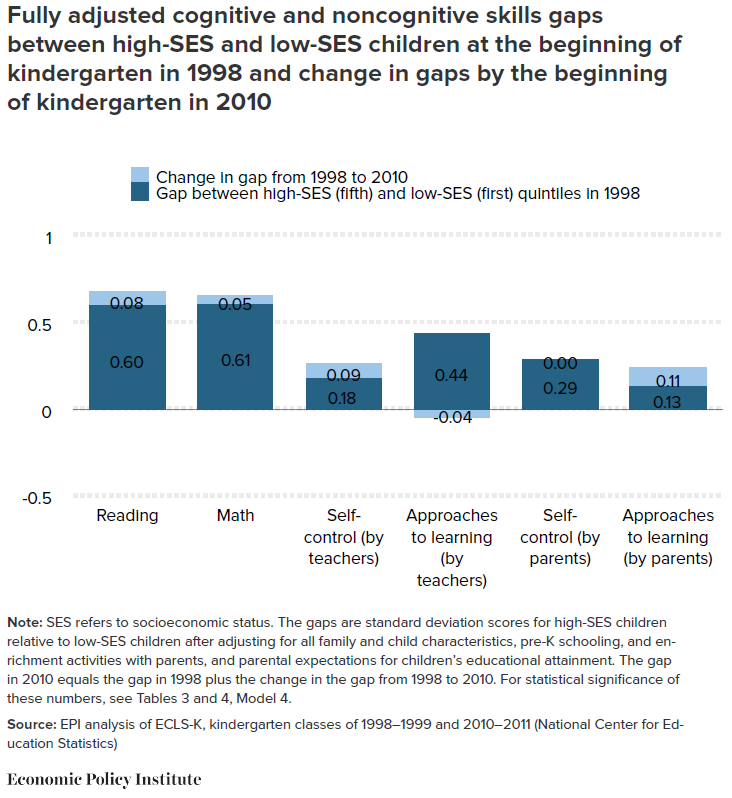 Learning gaps are already substantial and are only bound to grow. Recent research in the United States on kindergarten preparedness mirrors the gaps observed in later stages of basic education highlighting the importance of addressing the effects of poverty on education during the early childhood years. Academic gaps based on socioeconomic status are only expected to persist if we keep ignoring the significance of a holistic approach in early education. A growing number of school districts across the country have embraced systems of comprehensive enrichment and supports for many or even all their students, based on the understanding that nurturing healthy child development requires leveraging the entire community. These districts took different approaches to enacting those comprehensive strategies, based on each community’s particular mix of needs and assets, ideological leaning, available sources of funding, and other factors. But all begin very early in children’s lives and align enriching school strategies with a targeted range of supports for children and their families. Moreover, school districts embracing what we refer to as “whole-child” approaches to education are seeing better outcomes for students, from improved readiness for kindergarten to higher test scores and graduation rates and narrower achievement gaps. They thus can provide guidance to other districts and to policymakers regarding how to implement such approaches, what to expect in terms of benefits, and which policies at the local and state levels can advance those approaches. The Philippines likewise needs to look at its challenges in basic education through a similar lens. Poor learning outcomes can be easily traced to the early years of basic education. The Philippines needs to focus on providing support to children and their families during the elementary years. Addressing the effects of poverty on basic education should happen in the early years.